In the early 1930s, Boris Karloff cemented his reputation in our cultural landscape with films such as Frankenstein (1931), The Old Dark House, and The Mummy (both 1932). These films are timeless gothic fables that will be viewed and appreciated till the end of time. In 1932, Karloff took a brief sabbatical from Universal and made The Mask of Fu Manchu for MGM. This film is not like his other films from the period. It is not an immortal classic, and remains firmly entrenched in its era. It is a movie that is surrounded in the bigotry and ignorance of the period that produced it. The film is entertaining as a cult-trash flick but nothing else. The Mask of Fu Manchu concerns the fiendish plot of the terribly fiendish Dr. Fu Manchu (Boris Karloff) to find the sacred mask and sword of Genghis Khan. With the sword and mask of the ancient conqueror he plans to unite all Asian peoples against the white man. How mask + sword + Asian peoples = race war, I don’t know. On the track of the oriental madman are detective Nayland Smith (Lewis Stone), Sheila Barton (Karen Morley), and Terrence Granville (Charles Starrett). These are great stiff upper lip types that are sure to beat the foreign devils. Fu Manchu tortures Sheila’s father (Lawrence Grant) and sicks his sinister daughter Fah Lo See (Myrna Loy) on Terrence to get the sword and mask. Once he acquires the mask the mad doctor throws an elaborate ceremony with a crowd of onlookers. Neyland and Terrence hijack Fu Manchu’s death ray on use it on its malevolent inventor. Then Nayland and Terrence “heroically” proceed to reign down electric death on the rabble on the assembled crowd below. Oh well, they were just part of the “yellow menace”. 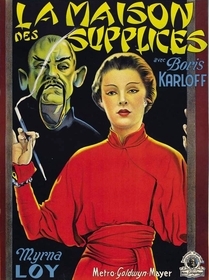 Xenophobia is a common theme in films including Dracula and The Mummy, but in The Mask of Fu Manchu it is the core concept. This film does not see the rich distinct cultures of China, Korea, and Japan. It sees most of the world’s population as one homogenous group of sinister savages. Fu Manchu represents what happens when of these people become educated. The result is death beams, snake pits, and evil geniuses. This is the curse of this film. The old-fashioned ideas and extremely bad taste of this movie make the film a trash classic instead of anything with substantial cinematic merit. There are some good things about the film though. Even though Boris Karloff thought the film was horrible he managed to give a very chilling performance. The scene where Fu Manchu tortures Sir Lionel Barton with a giant bell is especially memorable because of the pure evil that Karloff is able to portray. The role is far from the sympathetic creeps from Frankenstein or The Mummy, the character is much closer to the character of Hjalmar Poelzig from The Black Cat. Myrna Loy is also effective as the doctor’s vamp of a daughter. The rest of the cast is as boring and unmemorable as any horror film supporting cast has ever been. The sets of the film are very impressive. They are large and well designed. They sort of remind me of Indiana Jones and the Temple of Doom. Fu Manchu’s lab equipment is also impressive. One of the first monster books I can remember reading was the little Crestwood house book entitled "Mad Scientists." On the cover was a large picture of Fu Manchu and his very cool looking death ray. That image has stuck in my mind ever since. The Mask of Fu Manchu was a predecessor of such politically incorrect sleaze-a-ramas as Attack of the 50 Foot Woman and Blacula. It can be offensive at one point and stupidly entertaining at another. The film is nothing more than a silly period piece. The title villain would go on to be in many more films. Other British actors wearing oriental make up, including Christopher Lee and Peter Sellers would portray him. In my book, however, Boris Karloff will always be the definitive Fu Manchu. Check out The Mask of Fu Manchu if you are a Karloff completist or a lover of vintage bad taste. Charles Vidor was fired after a few days of shooting, to be replaced by Brabin. Karloff's makeup took 2.5 hours to apply each morning. Submitted by Dana (not verified) on Sun, 2010-09-19 17:13. I saw this because I adore Karloff. It was a hoot. A totally racist, un-PC, seriously dated hoot, but a hoot nonetheless.